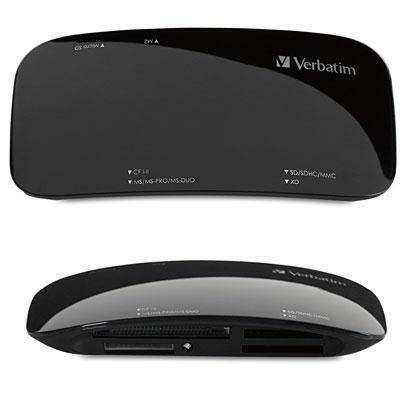 Verbatim's USB 2.0 15-in-1 Universal Card Reader makes transferring your digital photos fast and easy. With a sleek, modern design and piano-black finish, the Universal Card Reader supports a wide variety of memory card formats, offering plug-and-play functionality with both Windows and Mac operating systems. Once connected, you can instantly begin transferring your photos. Supports memory card formats including CompactFlash Type I & Type II (CF), Secure Digital (SD), Secure Digital High Capacity (SDHC), Mini SD , Micro-SD , Memory Stick (MS), Memory Stick PRO, Memory Stick Duo, Memory Stick PRO Duo, Memory Stick PRO-HG Duo, Memory Stick Micro (M2), MultiMedia Card (MMC), xD-Picture Card (xD), Secure Digital XC (SDXC); Sleek, modern design with a piano-black finish. Adapter not included.